SAP offers a wide range of knowledge sources to help you find a way forward – be it clarifying a simple question, configuring a complex scenario in your SAP solution, resolving an issue or, receiving/sharing best practices. In line with SAP Product Support’s Strategy, Next Generation Support for the Intelligent Enterprise, these knowledge sources empower you with a plethora of choices to suit your unique needs. In this blog, we outline the various help channels for SAP Cloud for Customer (and in fact, these cover almost the whole of SAP’s portfolio). If you aren’t using one or more of these repositories, this blog will help you achieve a quick start. If you are already familiar with the topics below, it should be a good refresher for you. Feel free to share your best practices via comments to this blog. KBAs are typically written to help with a single business process step or, when there is a direct correlation of a problem/error to a solution. Since November 2017, KBAs for SAP Cloud for Customer are also indexed on google and can be accessed without the need for any special credentials. Read this blog for details & best practices on searching for SAP Knowledge Base Articles. It is often said that knowledge shared is power multiplied; the more you share, the more you reap. SAP Community is the place for experts (including customers and partners) to showcase their knowhow and enrich their skills further by helping others. If you haven’t posted a question on SAP Community yet, now is the time to make a start. Take a minute to register yourself on SAP Community and start by answering somebody’s question or posting a question on the topic you need clarity on. You may also follow one or more product/topic specific tags to get notified about new content posted on SAP Community. See this 90 second YouTube video for guidance on How to submit a question on SAP Community. The SAP Help Portal is the single-entry point of all Product Documentations, across all of SAP’s solutions. It includes documentation on installation, upgrades, configuration, and latest features. The Learning Journeys section offers structured visual guides designed to help you navigate the path to becoming fully competent with your SAP solution. Click here to explore more on SAP Help Portal. Recent Questions and Blogs on SAP Community, relevant for the product chosen. It may happen occasionally that the business scenario you want to set up may not be available as a part of the standard delivery of the SAP solution. In such scenarios, SAP Customer Influence portal provides a very open and transparent framework for our customers to voice their needs. You can not only post your requirement for additional functionality here but can also upvote already existing ideas. Ideas with more votes will obviously stand a higher chance of making their way into SAP’s standard functionality in a future release. See this 2-minute YouTube video for guidance on How to use the SAP Customer Influence site. See this video for a simple recap of How to Search SAP’s help repositories. The video reference above also emphasizes Built-in Help. 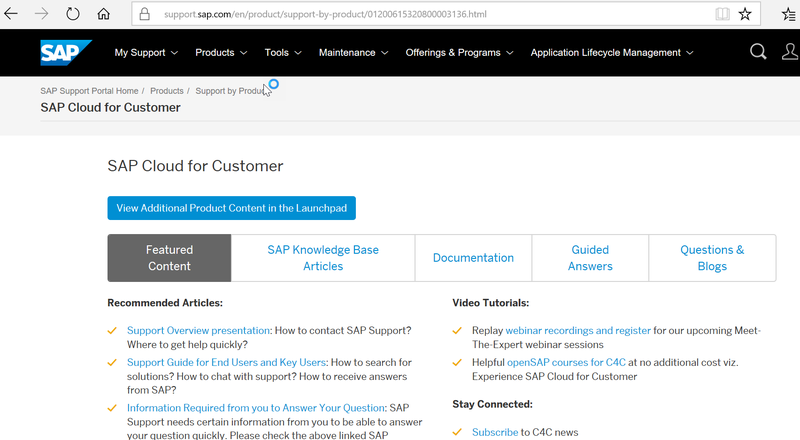 Also called SAP Help Center, it is accessible from any screen in your SAP Cloud for Customer solution, making it easy for you to initiate a search from within the SAP solution itself. The Help Center automatically performs a search within SAP Help Documentation, SAP Knowledge Base Articles and SAP Community, thus avoiding the effort to navigate across multiple browser screens. Expert Chat now available for SAP Cloud for Customer – click here. Next Generation Support – click here.